I’d made a number of tone decoder projects with the unique NE567 PLL tone decoder chip in 1990s, and most were published in Elektor Electronics (UK), Silicon Chip (AU) and Electronics For You (IN) magazines. Recently I found a batch of the nostalgic NE567 chips in a webshop and bought a couple of them for my new experiments. Described here is another tiny tone decoder module circuit good for a vast range of phase locked loop/tone decoder experiments. 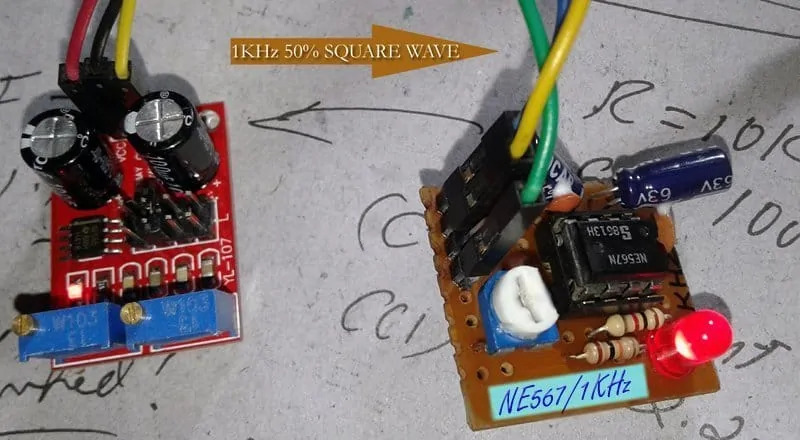 The NE567 is a general purpose tone decoder designed to provide a saturated transistor switch to ground when an input signal is present within the pass-band. The circuit consists of an I and Q detector driven by a voltage controlled oscillator which determines the center frequency of the decoder. External components are used to independently set center frequency, bandwidth and output delay. The center frequency adjustable from 0.01 Hz to 500 kHz. 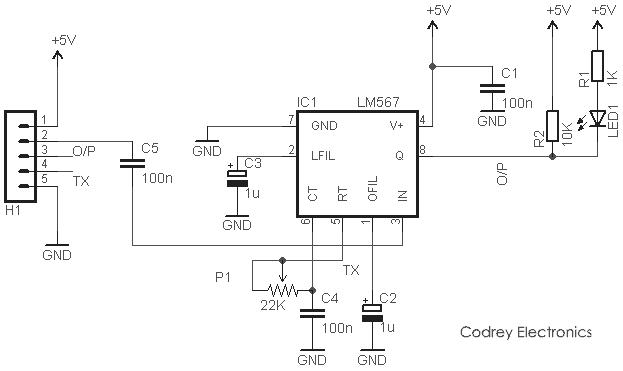 As indicated in the circuit diagram, circuit of the microcontroller-compatible tone decoder module works on 5V dc supply, and is optimized to detect 1KHz tone by default. The centre frequency is determined by the values of components P1 (11K-at mechanical mid position) and C4 (100n). The red LED (LED1) in the module is the ‘tone locked’ indicator. Formula for calculating the centre frequency of NE567 chip in our circuit is “1/1.1 x P1xC4”. Therefore, here it’s 1/1.1x11Kx100n = 1KHz! Shown next is the overview of the first PCB artwork (not scaled) just for quick reference. Interested readers will get the verified Gerber of the proposed pcb artwork by email from author if requested through a proper channel! That’s for all now… Happy Tone Decoding!